Rain's Garden: First Blizzard! 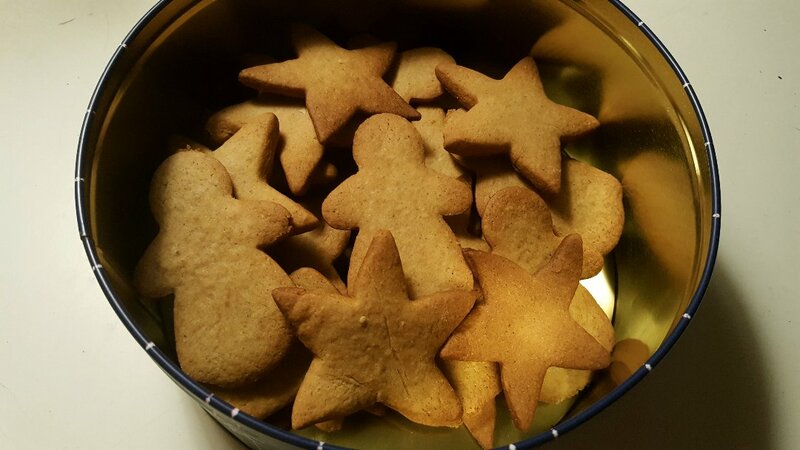 I've Been Baking! It's such a nice quiet Sunday, NO tourists around! How about that huh? 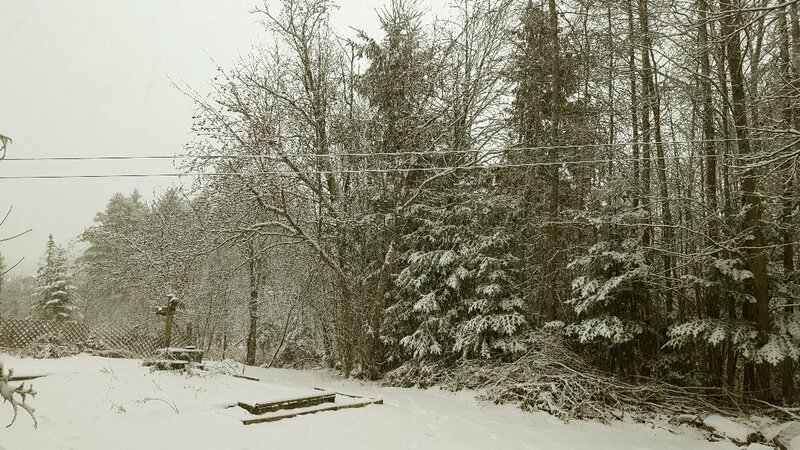 :) I woke up to our first little blizzard this morning, it's so beautiful. For those who have snowy winters...do you take down your laundry line in the winter? I never even think of doing that. 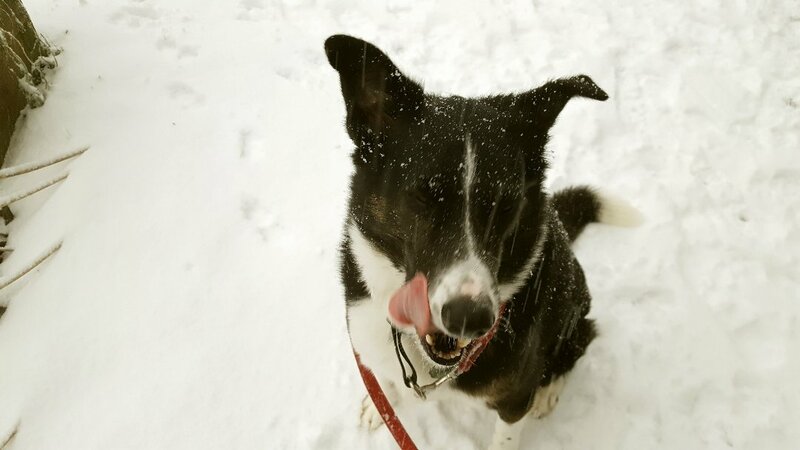 The dogs are having a blast in the snow, they just love it! Well, except for grumpy old Jack...I don't blame him though lol! I'm sad about it, but we have to be realistic. And I accept that my walks in the woods are just on hold for the next 6-8 months. Some comfort food always helps! It's really nice having two slow cookers! Last night I made myself a Harvest Time Chicken and Apple Stew; and for Alex, I made a Cottage Beef Stew. Just a reminder, on my sidebar, I have a link to all of my recipes and I always try to remember to add the links in my posts as well! These stews were perfect with some bread and butter for dipping! And we have meals for a few more days. 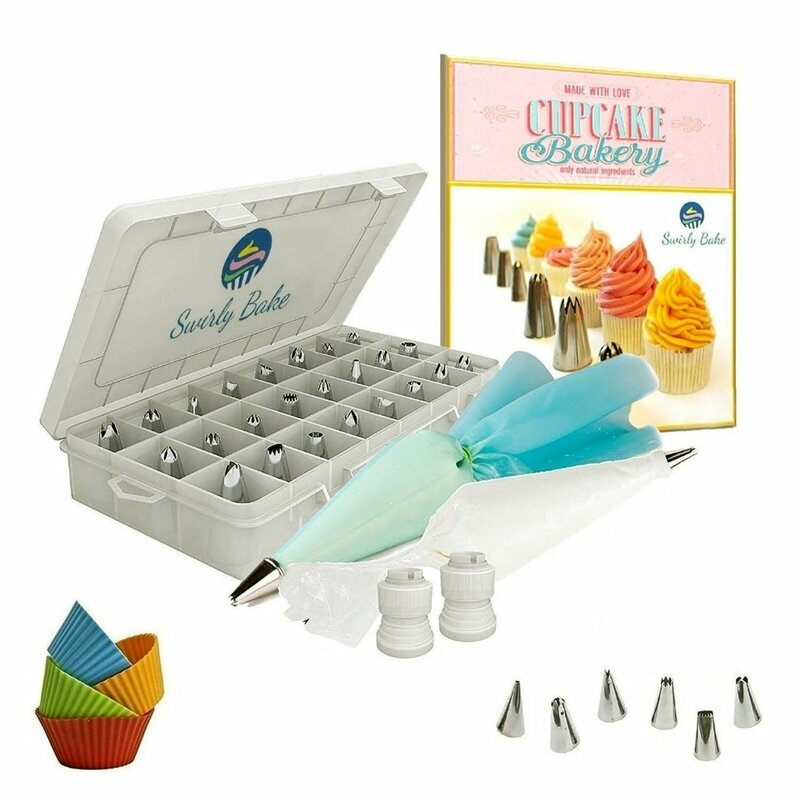 A cake decorating set!!! Talk about being on the same wave length...that's why we are soul mates! 😊😊 This is an early Christmas gift. He figured I'd get more use of it before Christmas so he wanted me to have it. Now I just have to figure out how to use each of these tips...this is my first set, how fun!! The baking didn't stop there...I've often said that baking can be therapeutic for me and when I start, sometimes I can't stop!!! In an effort to clean out the fridge and freezer a little, I made a variety of chips. Pita, Tortilla and Potato. The potato chips, we could take them or leave them, they just never cook evenly in the oven, but they were okay. Alex loves the pita chips and I love the tortilla chips. How much do you pay for a mediocre bag of chips at the store? Here a bag of Ruffles is $3.50 plus taxes ON SALE, and that's the standard bag. The "family size" (which is what the standard size USED to be) is $7.50. The pitas cost me $1.25 for the same amount. The tortillas are a little more and came to double that, but still much cheaper than the crap at the grocery store that's filled with mysterious ingredients! They're a snap to make too. Can't make chips without a dip though! 😋 This is my homemade Nacho Cheese Dip. Everything is from scratch...I love how far I've come with my kitchen skills! And again, this is so much more delicious than any store bought dip out there! It's such a simple recipe and I added some of my Homemade Salsa to it as well. Again...affordable and delicious...and I know what's in it. The snow is falling, the pets are all snoring, the fragrance of homemade bread should wake Alex up very shortly :), and I'm spending the day budgeting to ease my mind; and then knitting some more Christmas stockings for the dogs! How is your Sunday going? Look at the snow! No more grass for 8 months. Good weather for stew and soups along with the occasional fondue. Wow, a blizzard..your slow cooking dishes look so comforting and yummy! Baking is therapeutic you're right, as is blogging. Your home is definitely a place to rush back to (Alex in mind). i want a blizzard! i've been so busy prepping for thanksgiving that i made a pot roast in my slow cooker yesterday....soooo good! i might be using it a lot more when winnie comes home! 5 dogs is really a bit much! enjoy your snow! We have a blizzard here in Ontario too,,,,, oh well,, winter is here. Yes! Does this involve cheesecake? This sounds like Heaven! I am on the couch under blankets trying not to sneeze. :) sniffle. 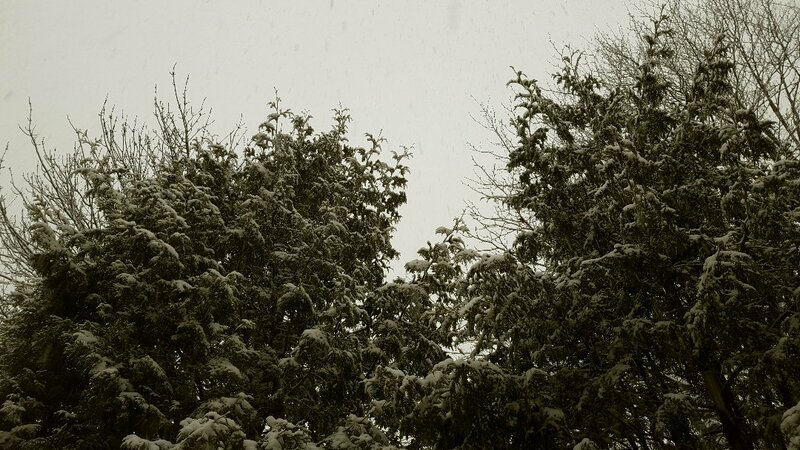 The snowy trees and grounds are beautiful. Too bad it has to be so cold for it to look that lovely. I really hope Stella and Pavlov's owner comes home. I would hate to see the two of them rehomed again. I can understand though................5 large dogs is a lot to have around and try and exercise everyday. I am in suspense about the cream cheese experiment. I need to get back to making all our stuff again too. I was so good about it when we first went to the nutritionist. But I seem to have gotten a bit lazy. I still bake our desserts from scratch, but snacks.....not so much. And yes............it is much cheaper to make your own and then you do know what is in it. How nice that you now have decorating tools. Alex is not stupid..........if he gives you the tools, you will keep baking and experimenting. That way he gets goodies too. Smart man. Have a great day, Rain. Rain, I love your little details of the day here...and that you have links to your recipe as I definitely lack culinary imagination. Oh wow, I so hope Pavlov and Stella can stay together if they need to go to a new owner. You have big heart to take car of so many of these adorable pups. You asked how our Sundays are going. Well, for me, we went down to a coffee shop and met some old (literally) friends and since then....all I have done, between making meals for Alex who is working on client projects, is read your blog and write MASSIVE comments which, btw, take me ages as I am a poor keyboarder and have to go back and fix almost every word, line by line! I have to say though, I feel I've come to know you more and am so glad for that. Feeling quite cosy now, thank you. I should note too that most of those looong comments are on your "Rain's thoughts" blog working from the most recent one backwards. ") I didn't occur to me that they were different blogs so no wonder I couldn't find them here to see if you had replied. lol. Got it now though. 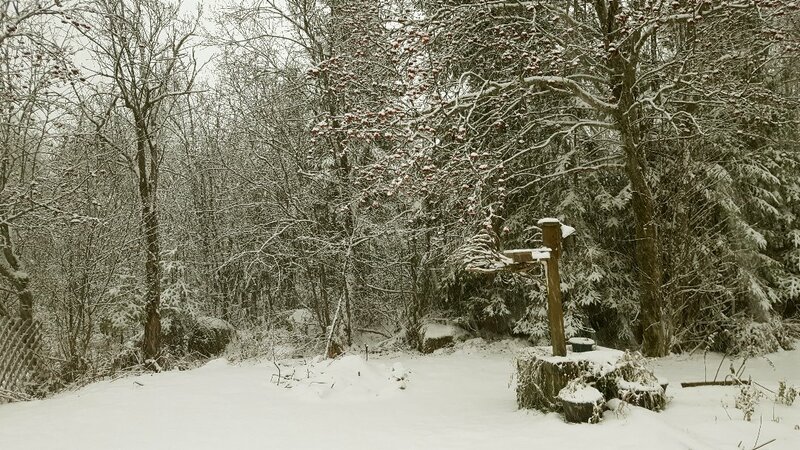 Loving that blanket of white....love, love, love.....and the food looks great! I remember how my Mom's laundry hung out to dry would freeze in the winter. One time as a kid I bent some of the clothes to hear them snap. My Mom was not too happy about that! 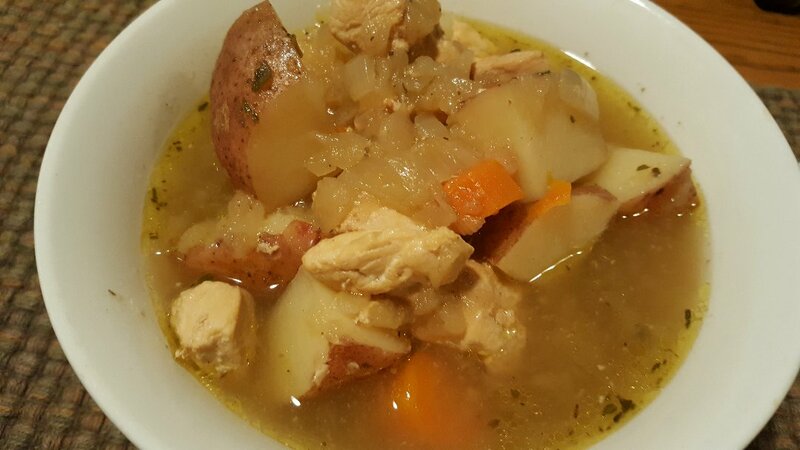 I usually don't cook but maybe I can surprise my wife with the slow cooker apple chicken stew or beef stew or both. When I was kid I loved the snow. But when I got older school or work would make it a burden to shovel it away, so I could get out. Now that I'm retired it can be fun again! Thanks for a another great post. Have fun with that decorating set! It looks amazing where you are, although I imagine it is quite cold. Poor Jack does look a little upset out there. That's the look I have when I'm outdoors and feeling really cold. LOL. The other dogs have wonderfully thick coats and I'm sure winter is a breeze for them. Do they struggle in the summer with the heat? Oh that decorating set! How sweet is that!!! And kind and thoughtful. It's those little things that define love. You are two peas in a pod. There is no laundry line on our property but I will choose a location for it in the spring. We need to do our landscaping first (add hedges, trees and fix the flower beds) before we can determine the best place for one. "The Great Cream Cheese Experiment of 2017" LOL That is too funny. Can't wait to see how it all turns out! Wow! Snow! How long will it last? Our "Cold Front" Blew in last night and we are down to a chilly 4 C at night. Still near 15 C during the day. Bah humbug! to the snow! I'm sorry for your snow. ;^) I don't want snow just yet but I know it is only a matter of time before it comes down to lower elevations. The snow scenes are lovely (even though I hate snow), and the cookies look yummy (love cookies). i think you are so right while deciding about both pets as being realistic and taking only bearable burden on shoulders is wise to me . i am so sorry that due to cold you are facing much leg pain these days my friend ,i really think you should take it serious and go for checkup i am sure doctor's advise and medicines will help lot to make it less . How sweet of Alex to surprise you with early Christmas gift dear Rain ,i can tell you both are so lucky to have each other as "soul mates" sweet friend! hope you will find time for your proper walking soon so can feel at ease and compose your energies more. agreed that when outdoor weather is harsh cooking and baking can bring lots of positive energy and sense of achievement to one's spirit . food looks so delicious and inviting !!! Loved the naughty poses of your darling pets my friend! 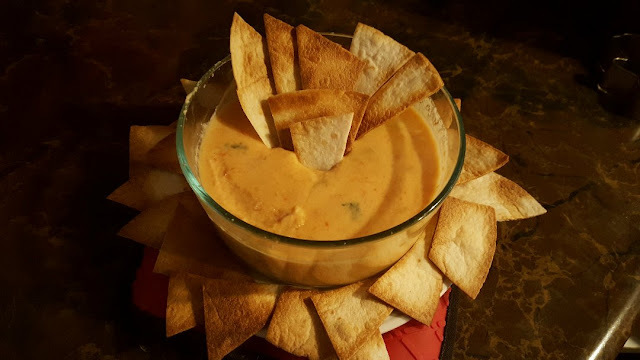 I found a recipe a while back for a home-made Doritos Ranch chip, using home made tortilla chips (from store bought tortillas). One of these days I'll actually try it! 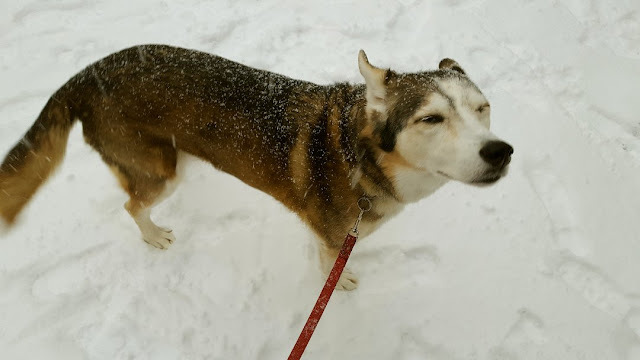 Ah the snow has found you! :) Love snowy days. Its heartbreaking to know that you will have to give up the dogs if the owner doesn't come back. What a shame that you had to be tossed into it eyes wide shut. Even if playing in the yard brings them joy then that is good exercise. Toss a ball for them and that's perfect!! They love it just as much as a walk I am sure. How nice of Alex to get you that early Christmas prezzie!! :) Happy decorating! 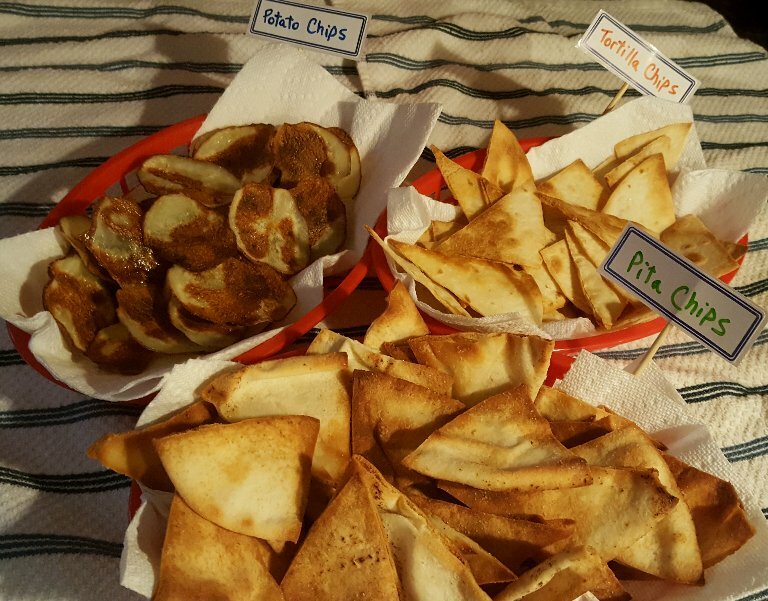 Those homemade chips look really good! I have made in the past, but again, its my lack of free time that brings everything I really want to do to an almost full stop. Except cheese. 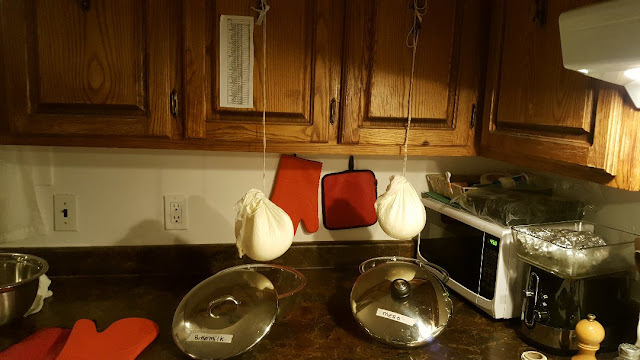 There will always be time for cheese! Hi Gill :) 8 months...that might be pushing it very slightly lol...but definitely until May. I would say winter is the best comfort food weather! Hi Marsha :) Alex is a smart guy, we always joke that the monthly cookbooks aren't just for me lol! :) We both benefit so it works very well. That cake decorating set is so nice...last year I made a Yule Log cake and I used a rolled up piece of parchment with the tip cut off...it was a MESS...I can't wait to use this set! My next endeavor will be making my own tortillas and pitas so I can avoid buying those again. It's fun, but you have a good point, it takes up a lot of time. Sometimes I feel very lazy and just want to order a pizza...then I remember I can't order a pizza in this area lol...but also, homemade is much better! Hi Michael :) The whole dog situation is at the forefront of everything it seems. Five is a lot of work and I do hope it doesn't come down to us finding them new homes. But there is a side of me that doesn't trust that their owner will be stable enough for them again...and that side that wants to keep them lol...I'm all over the map! But for now, they are in great care and very sweet, so all is good! Thank you for all of your comments, and I'm glad we are getting to know one another! I love reading about people's days and what they're up to, so naturally that's what I write about. Ah, the cream cheese experiment...came to a successful end last night...stay tuned lol! Feel free to check out the recipes, if you have a crockpot, those slow cooker stews are easy and delicious! Hi John :) That's funny about bending the clothes! I would be tempted to do that as an adult lol. 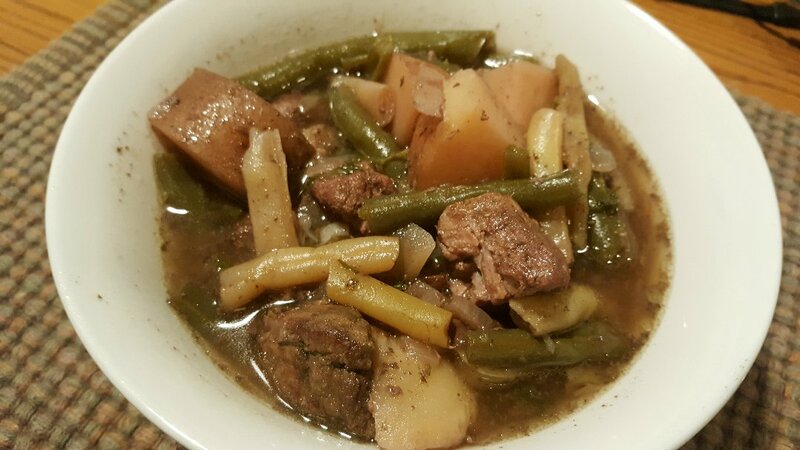 I hope you try the stews, they really are comforting and delicious and easy to make. They make the house smell wonderful too! I did my first bit of shoveling this morning...that's what I really don't look forward too. At the moment, we can't afford a snow removal service or a snowblower...so it's all manual and boy do we get snow here...good exercise though! Thanks Debra! :) Everything will be decorated lol...I have so many ideas! Hi Becki :) Thank you, I'm glad I'm inspiring you to get into the kitchen! I think besides my sleeping time in the bedroom, I spend most of my time in the kitchen, I love it. The snow is really nice this time of year. 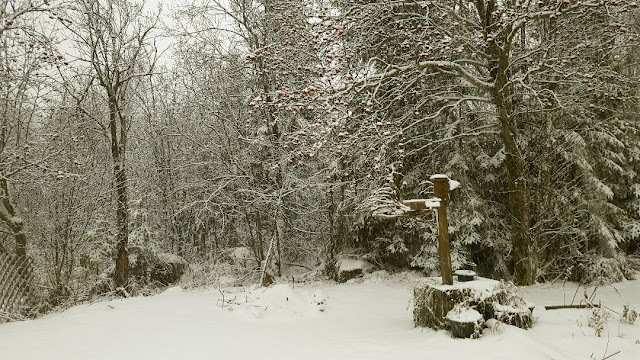 In 2014, we had our first "green" Christmas and it was miserable, so I can't complain (too much? ;)) if we have snow in November! Hi Martha :) It's pretty darn cold this morning...we had a few just below zero days, but today with that wind, it's back to the minus 20's...too cold for me! You and me and Jack...lol...even with that big coat he had on, he was not happy with me, but he's smart, he does his "bidness" and runs back to the porch as quickly as he can and under the blankets on the couch! Oh I like that! Two peas in a pod :) Yeah, he's definitely very sweet and knows me very well too! Charlie is the winter gal...her coat is SO THICK. When we got her in 2014, she was a tiny little gal, weighed 40 pounds, now she's grown up more and weighs 80 pounds at least. We now can confirm she was likely only a year old when we got her. 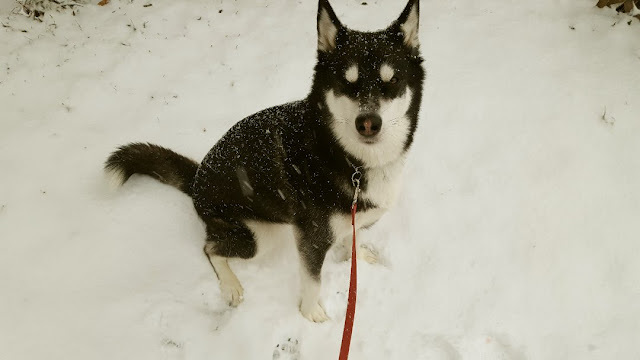 She LOVES the winter. She never wants to come inside. 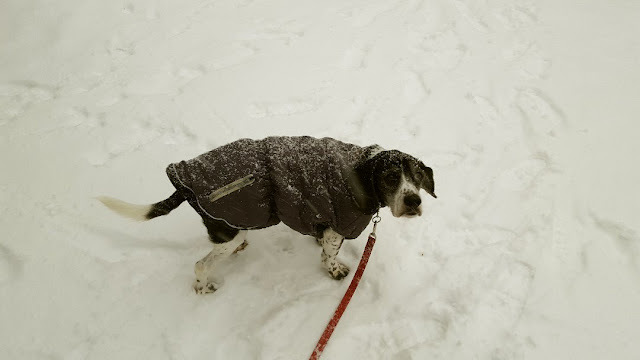 We put her, Marlene and Pavlov out on ropes and they are happy to just sleep in the snow for hours. Those three have the thicker coats. Marlene seems okay in the summer as long as she's in the shade, but Charlie can only handle being outside for a short while, then she hides in the basement to cool off. Hi TB :) Oh the snow...well, our last snow fall was mid MAY last year...usually we have full-on winter until April, some teases of spring then another big snowfall in May, then full-on summer. Wacky climate here. But it's too long for me. When we move, it'll likely be to the Maritimes where it's just a little milder, depending on the area. Thanks Starting Over :) My relationship with snow is love/hate! :) The cookies are gone. :) I need to figure out some rationing method before we pop all of our buttons lol! Hi Baili :) It's sad to me about the pets, but it's just too much. They are a sweet and wonderful burden though :) My leg needs some recovery time, so this could be a blessing in disguise. I feel that it's muscular because there were a few days when I wasn't feeling well and didn't do my yoga and the pain came right back. Cutting out the long dog walks might help me heal quicker, but worse case, I'll go get medical help for sure. I need my leg to be healthy! Hi Ruth :) I use the laundry line in the summer to "start" the drying process...then most of the stuff has to go back into the dryer for at least 20 minutes to get all the pet hair out. I hate using the dryer, but otherwise, things get too itchy for us! I think you should try that ranch dip! That's another dip I want to try to make at home because I LOVE Ranch everything...salad dressing too. So many things I want to try! Hi Dianna :) Cheese!!! CHEESE!!! You have the cheese bug ha ha ha...no turning back now! I bet your Mozza is all gone by now! :) I'm so glad you tried it out...onwards and upwards, is a Cheddar next? I know what you mean about the homemade food...it IS time consuming and if I wasn't a full-time housewife (I'm so proud of saying that!! ), I wouldn't have the time or energy to make all this stuff at home. When I worked, I only ate frozen dinners (gasp)...I just didn't have time for even cooking back then. Eyes wide shut is a good phrase to describe things. I don't even want to think about the idea of giving them away, it makes me too sad. Those "what if's" start happening...I have trust issues. I've seen a lot of animal abuse over my life and it just scares me that people who seem like good people on the outside will hurt, neglect and abuse their pets secretly...sickening...so it makes my heart want badly to figure out a way to keep them if that's the situation...anyway, we live one day at a time right? They're very happy right now so I'm concentrating on that! I envy you for the snow. And this all looks delicious. Hi. Rain! I enjoyed your post. 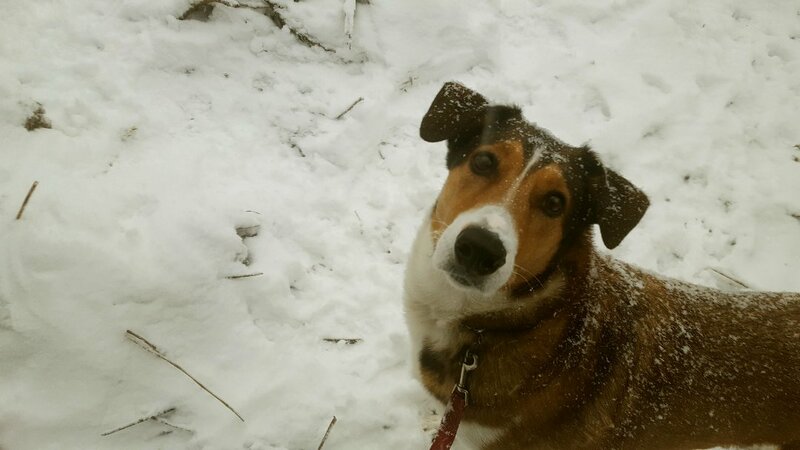 The snow was lovely, and your dogs are cute. I'm sorry that it is difficult for you to get all the walks in, but, then, five dogs is a lot! I like to cook from scratch, too, but I'm not as far out along the continuum as you. I'll have to try your dip recipes. I have an easy guacamole dip that my family loves and might go well with your chips: 1 avocado, 5 cherry tomatoes, 1/2 jalapeño, 1 slice crosswise slice of a large sweet onion, juice from half a lime, and 2-3 drops of tobasco sauce. I finely dice the tomatoes, onion, and jalapeño, add the lime juice, and tobasco, then mash the avocado into the mixture. I like to use an old-fashioned pastry cutter to mash the avocado because it works beautifully. I mix it up just before I serve it. The recipe doubles well, but the single recipe works fine for two people. Delicious. You positive, comforting post was just what I needed. Take care! Hi Nancy :) Thanks, when I find the energy I sometimes overdo it. The day after that big cooking day, all I could do was sit and look through recipe books, I had to recover! Honestly Alex and I only really eat one meal a day. We snack a bit during the day and have fruit shakes, but our big meal kind of takes up all the daily calories. That plus a few (short) dog walks, and I do some cardio each day for my mental health...so I guess it all comes together :) But every winter I do gain weight and it comes off naturally in the summer. So far it's a good balance! Oh, how I miss blizzards! It's been years and I used to love them on the farm...driving to work and back not so much! LOL! Your cookies look delicious and I love the decorating set...that Alex is truly so thoughtful! He's like a mind reader! I was hoping to see some decorated cookies but I guess we will have to wait in suspense for that and the cream cheese experiment. I have been cleaning and organizing more than baking but you are tempting me as Christmas cookies are the best! I know what a difficult time it has been for you with he extra animals and the cold is not a help to those with joint problems for sure. You will make the right decision when the time comes. Take care and stay warm. Thank you for all your recipes...I haven't tried them yet but I plan on it!!! Congrats on the little person Nik :) I'm sure you're very busy, more than usual! I'm pretty much used to the snow now. It's always a bit of a shocker when we get the first deep freeze though!